Rock gardens are a lovely way to create an area that is visually and texturally different from the rest of the garden. Take care to choose plants which don't completely cover the stone or are easily pruned back. Some plants will creep and root between the stones. Choosing plants which contrast the stone can make it more dramatic. 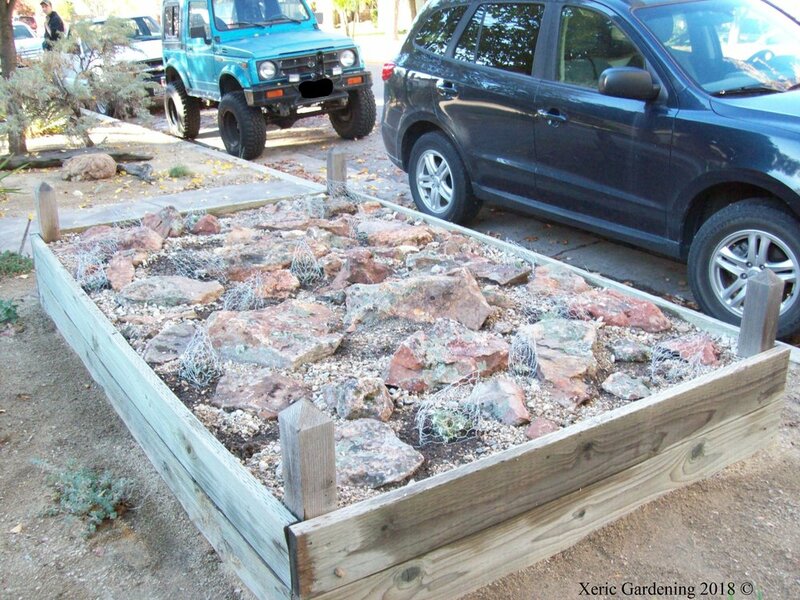 Decide how xeric you want your garden to be and that will help you make the correct plant choices. Here are two projects. While constructing the rock garden, take care to create space enough for planting. These stones were placed at a gentle grade down to the pathway. See if you can find stones that already have lichen or moss on them. The clients did not want to extend their irrigation out to this raised bed, so we planted natives that would need to be hand-watered only every 3 weeks. Plants look small, but are getting established. You can always plant more densely. After the stones were placed, we planted, and, as you notice in this picture, the plants are caged. This is to protect the plants from the squirrels as they are getting established. Along with groundcover perennials, we planted a few taller ones for more dimension. We have planted purple sage in the middle for some height, Pursh's milkvetch and desert fleabane closer to the edges to drape over the sides. We noticed some docile native bees moved into this raised bed when the plants started to bloom. Hell strips are the land strip between the sidewalk and the street. The reason they're called hell strips is because they can really feel the intensity of the heat from three sides—the sun, the sidewalk, and the street. Plants chosen for these sites need to be able to withstand the exposure and still look good. This hell strip will be getting a lot of foot traffic from people getting in and out of their cars. This client wanted something low which could be stepped on occasionally and survive. We planted Woolly Thyme and a couple of Fescue grasses for some height, expecting the Thyme to completely cover this area eventually. 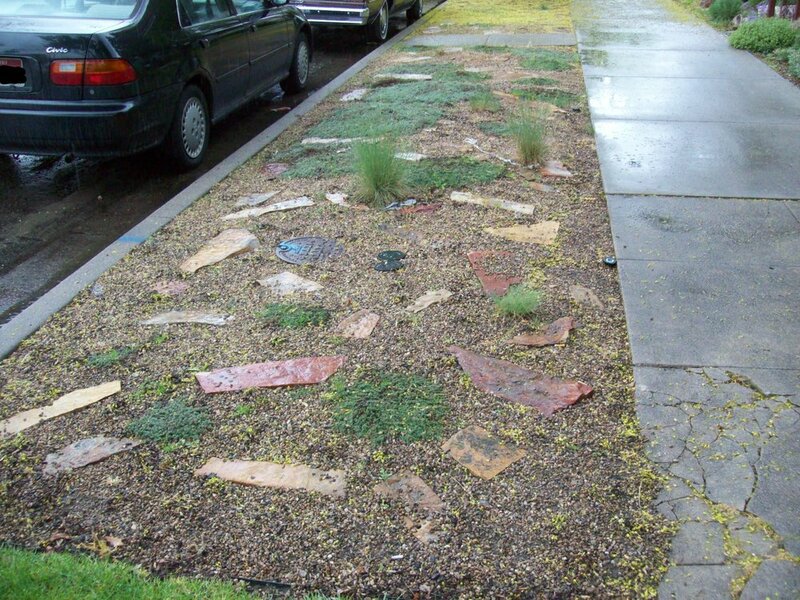 The gravel is meant to cover the bare earth to prevent tracking mud while the Thyme is growing in. 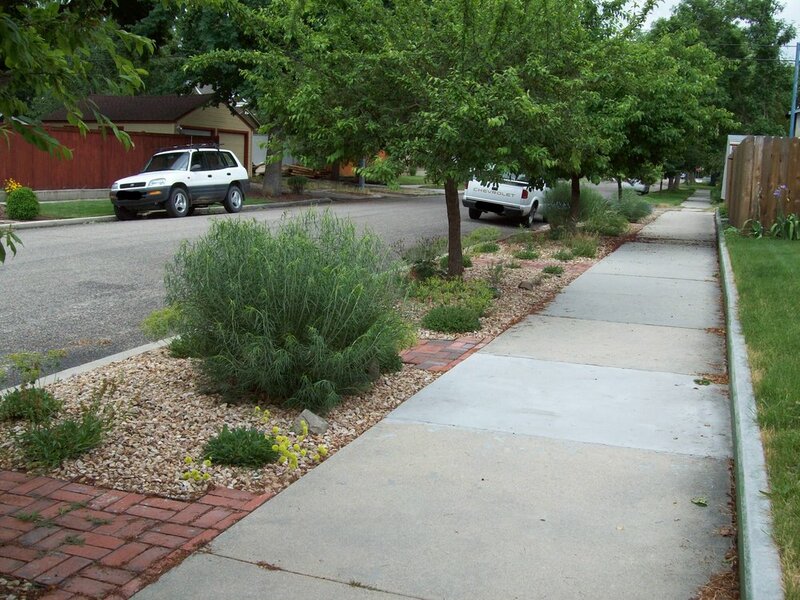 In this example, the hell strips have bigger permanent gravel and taller plants. There is only occasional parking here, so taller plants won't be obstacles. Brick pathways have been installed to channel the foot traffic. The best way to keep the gravel pathways looking good is to use a blower regularly. Plants in this hell strip include Sulfur Buckwheat, Rabbitbrush, Great Basin Wild Rye, Yarrow, and Penstemon. This commercial building had a south-facing hell strip and a wall, which increased the oven effect, but made it possible to put in taller shrubs, too. We have combined shrubs with flowering perennials to give color and height throughout the year. This isn't exactly a hell strip in the strict sense of the word. This is a north-facing bed between a wall and the Greenbelt. The client wanted taller plants for some privacy but wanted beauty for passersby. This only gets watered once a week.